Halftone. Thick sketchy strokes. Broad colour brush paints. Zombies. Robots. Mad scientists. They belong in a crazy world that's created by Chris Ryall and Ashley Wood. This is a large format graphic novel that tells a story of an experiment gone terribly wrong — like it always does in horror stories. The cast and concept are similar to the movie 28 days later, except with robots thrown in. 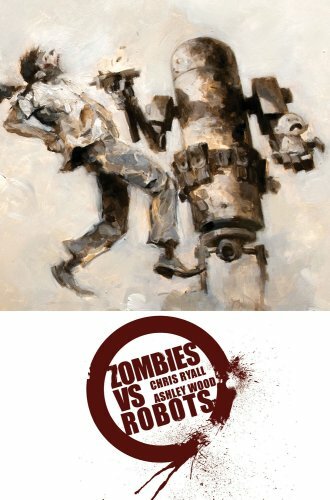 You'll get to see zombies and robots slug it out on the large canvas painted by Ashley Wood. The sketchy, chaotic brush strokes seem complementary. Ashley Wood's style is indeed unique, sometimes bordering on abstract. I still prefer neat panels because they help in story flow clearly. At the back of the book are a few pages of cover art done on robots. They look like oil on canvas. The book ends off with a hint to a sequel, which there is in Zombies vs. Robots vs. Amazons.